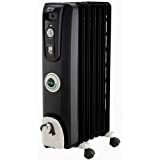 DeLonghi - EW7707CB: Space Heaters • The Air Geeks, reviews of air conditioners, dehumidifiers and air purifiers. Delonghi EW7707CB is a heater designed to heat any kind of middle-sized or small room by using special diathermic oil permanently sealed in a series of oil chambers to avoid mishaps while dealing with it. And as you begin to notice the days getting shorter and the nights getting chillier, you know that winter is just around the corner and you should be well prepared. Delonghi EW7707CB is an oil filled heater. This means it uses pure diathermic oil placed in chambers to produce heat. The chambers are permanently sealed and usually will not need refilling during its lifetime. A heating element placed underneath is linked to all the steel chambers and heats each one of them individually. Heat is transferred to the surrounding air which is in turn distributed evenly around the room by convection currents. This makes it one of the safest heaters to have especially if you have children. You won’t have to worry if your kids or pets touch the appliance as the exterior’s build ensures that its body remains safe to touch while still being able to produce more heat quickly. A topple protection switch is included to ensure the appliance does not continue to run if it has fallen down after a kick or a push. This heater produces no fan noise as there are no moving parts inside. This makes it ideal for use in bedroom and study room where total silence is needed for maximum concentration. However, during its first use or after a seasonal storage, a low popping sound that lasts a few minutes can be heard as the oil gets heated up after which it is completely silent every time you turn it on and use it. There is no digital display or a timer function on the control panel of this heater. They decided to go with a rotating knob whereby you can adjust the temperature to your desired level. Though this works in most of the cases, there is no way to know how the heater is doing in real time. You won’t be able to see how many degrees remains until your set temperature is met. Also, the lack of a timer means that you will have to be there personally to make the sure switch it on or off. You will also have to physically move to the heater every time you want to change settings as there is no remote-control capability. This heater weighs about 24 pounds and has a height of 24 inches. It comes with patented smart set omni-directional caster wheels to enable easy movements and relocation. There shouldn’t be any need to lift the appliance unless you are moving it from one floor to another, whereby you should ask for help if you are not sure you can safely relocate it on your own. This heater comes with a one-year limited warranty and life time support. It is maintenance free since the oil system is permanently sealed. You won’t incur costs for buying bulbs or heating elements. Everything is preassembled including the smart wheels so you are ready to plug the device right out of the box and it is ready for use. Bought this Heater for our Finished Basement that my son has turned into his room, it's very open being we don't use it for anything and always seemed a bit cool, this space heater has outdone itself ! just what we needed to take the chill out of the air! we keep it on 700watts with the thermostat on 4 and to me, it was a little too warm down there! The directions could better describe the functions of the comfort temp button which is supposed to save energy, NO noise, NO leaks, No clicks Knocks Bubbling sounds at all! Just GREAT Purchase, will recommend Based on my 5 days of use!" use! buying this heater, I've always used ceramic heaters for supplemental heat. Make no bones about it, if you want to heat a smaller space quickly a ceramic heater is your best bet. If you want to heat a small or medium-sized space over time, especially if there! to do so quietly, this Delonghi will do it. Additionally, it doesn't dry out the air nearly as much as a ceramic space heater. The fins do get hot, perhaps not the best choice around small children, but you can also put a bowl of water on them to humidify the space further." As you have seen, Delonghi EW7707CB does employ some powerful user-friendly features to ensure you get the warmth you need comfortably and economically. Patented smart wheels ensure you can move your appliance with ease, without having to lift it up to relocate it from one room to another. Some of the features it lacks are not so significant that it affects the performance of the appliance though they could drive away potential customers. These include a good digital interface and a timer. We wouldn’t want to dissuade you from buying this appliance if you feel it is perfect for your situation though there are better competitors out there at the same or even lower price.